In 1968 one particular band were outselling acts like the Beatles, the Rolling Stones and the Monkees with one song that topped the US chart and made number seven in the UK. The song was Green Tambourine by the Lemon Pipers. Your average music person will swear blind they only had one hit, but there was a minor follow-up, Rice Is Nice, so let’s find out about it. 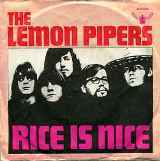 The Lemon Pipers were a psychedelic band formed in 1966 in Oxford, Ohio and comprised singer Ivan Browne, guitarist Bill Bartlett, bassist Steve Walmsley, keyboardist R.G. Nave and drummer William Albaugh. They were students at the time and most had played in various student bands before all getting together to form The Lemon Pipers. A chance meeting with impresario Mark Barger pointed them in the direction of Buddah records where they signed a deal. On the back of the song’s huge success the obligatory follow-up was required and as Nave recalled in an interview with Cincinnati Magazine, “I distinctly remember being in an 80th floor office in New York saying to myself ‘I don’t want to record these stupid songs.” Browne, in the same interview said, “It wasn’t long before it showed and that applied to most of us.” Rice is Nice was a ridiculous song about matrimony with the cheesiest of lyrics, ‘Rice is nice, that’s what they say, rice is nice, throw some my way, rice is nice on any day.’ Clearly the record-buying public were equally unimpressed as it stalled at number 46 in America and 41 over here. By now they didn’t care because at a New York Awards ceremony where they received a gold disc for Green Tambourine the band purposely slaughtered Rice is Nice in the presence of all the label’s top brass. One further single, Jelly Jungle (Of Orange Marmalade) was already earmarked and was as bad as the title sounds and by the spring of 1970 the Lemon Pipers broke up. The sad point is that the band were very happy with their own ‘sound’ and were never really given the chance to showcase it. If they had been given that opportunity and maybe even signed to a record label that let them have artistic control, their career could have been very different. That’s probably one upside to today’s technology where you don’t necessarily need a record label to launch a career and make a name for yourself. So, what happened to the band; Browne moved back to California and is a postman by day and he and his wife have been making music for over 30 years and is available to download at ivanandisa.com. Walmsley continues to play bass and is currently a member of Second Nature. Meanwhile Bartlett formed the short-lived band Starstuck, but then joined Ram Jam who recorded a funk/rock version of Leadbelly’s Black Betty and were rewarded with a UK number seven hit in 1977. Bill Albaugh died in January 1999 and Leka passed away in October 2011. Shelley Pinz became a psychotherapist specialising in the use of music, art and poetry. She also gained a Master’s degree in social work, and in 2001 she published a volume of poetry and lyrics called Courage to Think.